Leave it up to our R&D team to put together the best kit on the market. The quick release quadrant and firewall adjuster are machined from billet aluminum for strength and are anodized for protection. The firewall adjuster, with an industry first, features a finger grip for easy adjustment, a knurled lock nut to maintain that precise adjustment and a chamfered retention screw slot for a flush fit. Our premium heavy duty Mustang clutch cables are better than O.E. quality and feature double lock nut adjustment. Each item is available separately and will interchange with most other aftermarket systems. Buy the whole Mustang kit and save! JEGS Easy Kits are designed by JEGS Professionals to help you get all the performance parts you need. 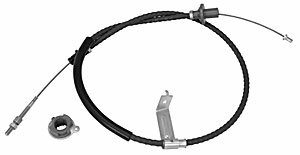 This kit includes a replacement Mustang clutch cable, finger grip firewall adjuster, quick release quadrant, and clutch fork. Does JEGS 60147 fit your vehicle?